There’s something about an albino that’s uncanny. This plant is both spooky and funereal. Shiny kettle. Clean stovetop. Aaaaaaah. Being reclaimed by nature? Check! By now you know: this is my kind of thing. 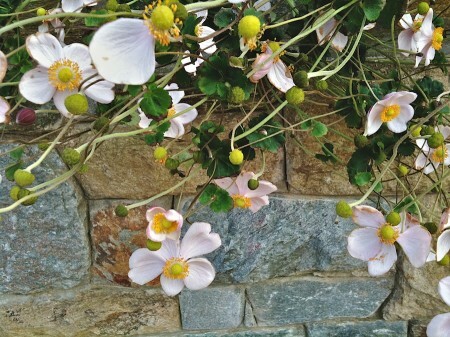 Against the autumnal tones of the stone wall, these lingering flowers are saying “Still alive, still lively, still here!” The tangle of stems and seed-buds shows no signs of surrender. It’s worth having a look at the full size version of this graphic depiction of space exploration missions. The Library of Congress gives me a warm, fuzzy, proud ‘n’ patriotic feeling. Of everything I’ve ever photographed in color, this log with white fungi and the gradually fading remains of a decaying leaf looks most like a colorized black-and-white image.